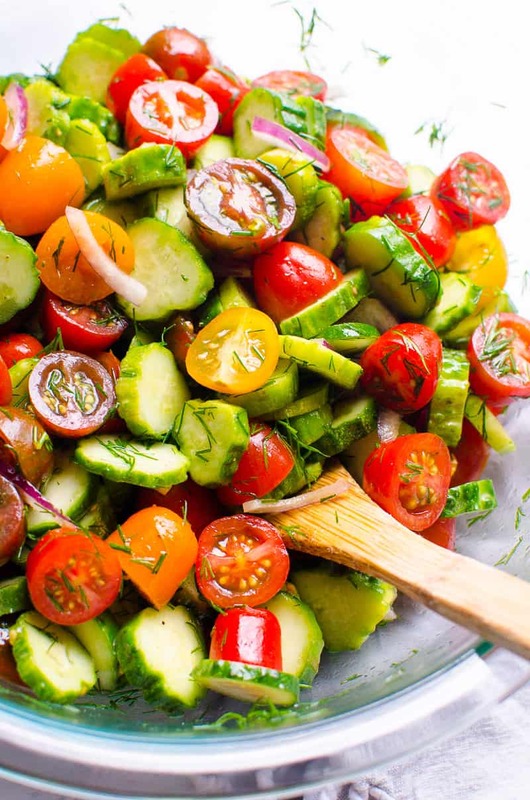 This classic Ukrainian cucumber and tomato salad makes healthy and affordable side dish any time of the year. With so many ways to customize it, you will never tire of it! 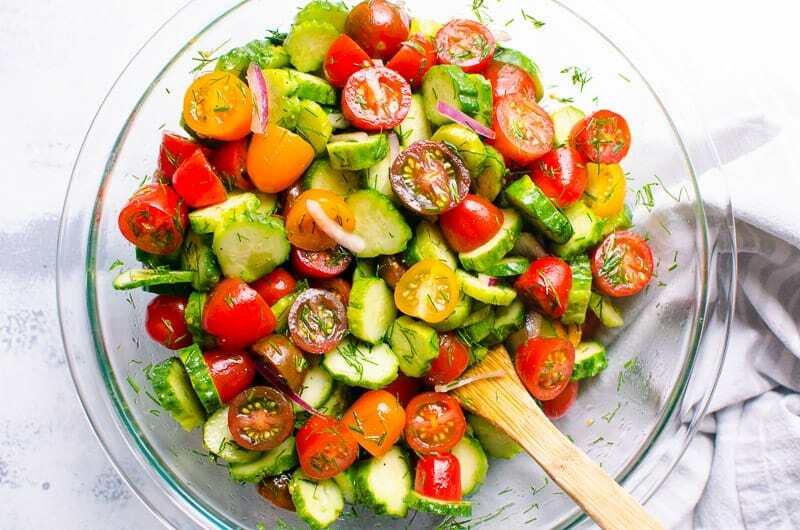 This is why this cucumber tomato salad is so cool – use garden’s bounty or winter store’s availability. I will die with this being my favorite salad ever and banana – favourite fruit. I can’t believe I never posted this recipe on the blog because we make it year round! Hello, we are Eastern Europeans. 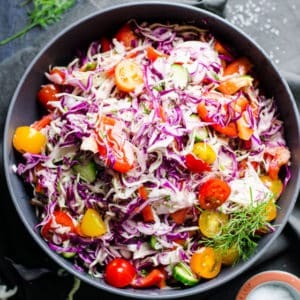 If you ask any kid who grew up in former USSR, they would tell you they ate this tasty salad at least 10 times during summer. Every household prepares it differently but the base is the same throughout many countries. Cucumber – Any kind of cucumber like pickle, dill, garden, long English or Persian work. You don’t have to peel or seed them. Stop that cooking magazine non-sense immediately. Tomato – Any kind of full-grown, grape or cherry tomato work. Juicy on the vine, heirloom or roma tomatoes are the best. But don’t shy away from field “plasticky” tomatoes from Mexico in winter – just choose the softest and reddest. Onion – Red onion is best to eat raw, however ain’t anyone had access to it in Ukraine. White onion works like a charm as your last resource. Or skip it all together. 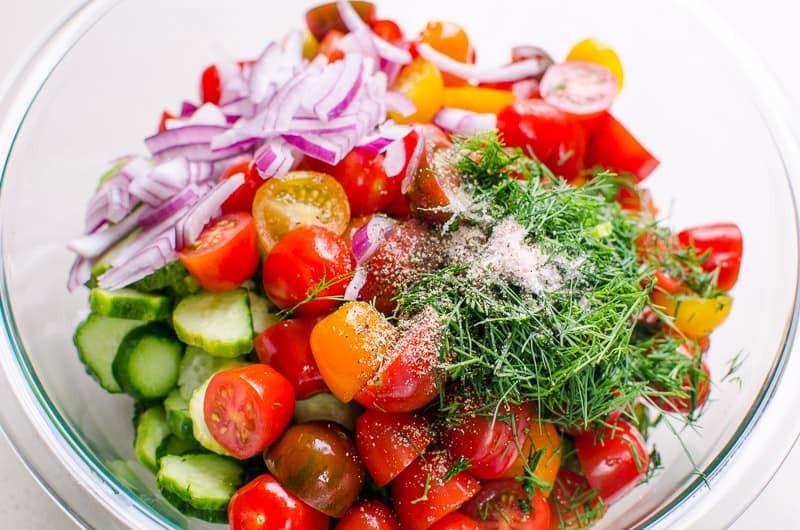 Dill – It’s a classic herb for cucumber, tomato and onion salad. It is a combination of extra virgin olive oil, toasted sesame oil, salt and pepper. That’s it! 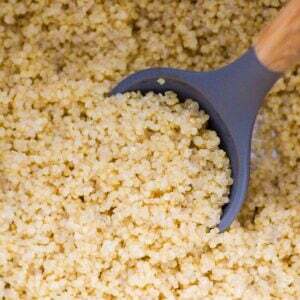 And no need to make it in a separate bowl, trust this mama. My grandma never did. 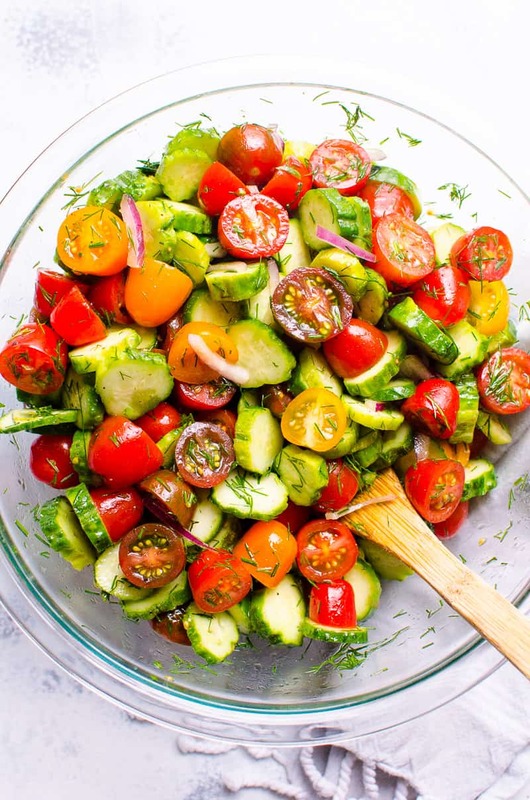 The secret ingredient is toasted sesame oil that takes this cucumber tomato dill salad recipe to the next level. 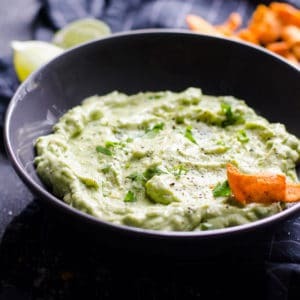 You can buy it dirt cheap at any grocery store (look in Asian aisle just in case) and you will use it often in Asian dishes like cauliflower fried rice, beef stir fry and healthy peanut chicken soba noodles. 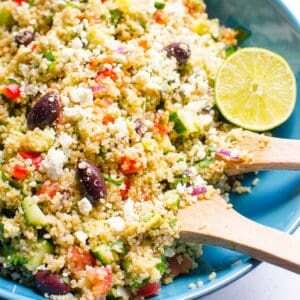 Or keep it for the sake of this easy salad – totally worth it! Skip toasted sesame oil – It’s totally fine. Use good quality extra virgin olive oil, not just “olive oil”. Add vinegar – Just a splash of white, white/red wine vinegar or even balsamic if you like that zippy tangy taste. 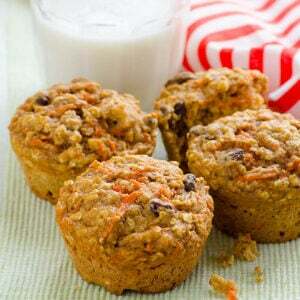 Make it creamy – Just add plain regular or Greek yogurt and omit oils. We used sour cream in Ukraine all the time. 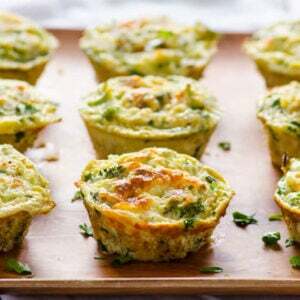 Change herbs – Use parsley or green onion (skip on red onion). 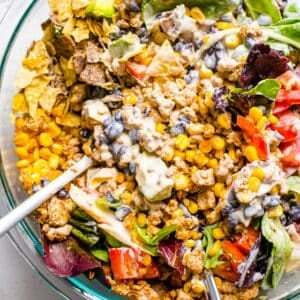 Add lettuce – It will basically become my lettuce salad. It’s more leafy and needs a bit more salt. Chop cucumbers and tomatoes in even bite size pieces. Stir gently. Best served immediately, however salad stays crunchy for up to 24 hours. 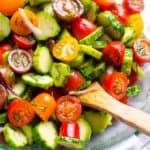 Care for More Cucumber and Tomato Salad Recipes? 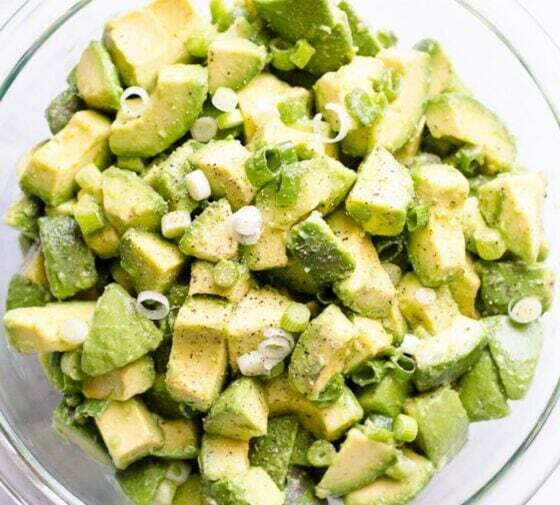 Chickpea avocado salad – protein packed juicy salad. 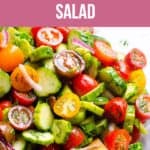 Lettuce salad – a version of this salad with lettuce. Healthy spinach salad that goes with everything! 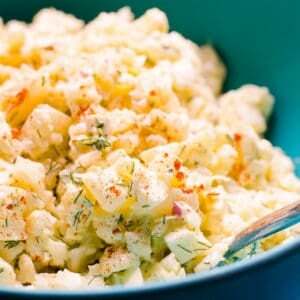 Classic Ukrainian salad that is so tasty, easy, dirt cheap and you will never tire of it. It’s that good! 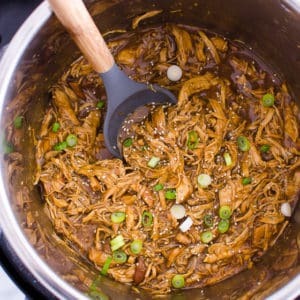 In a large bowl, add all ingredients and stir gently. Best served immediately, however salad stays crunchy for up to 24 hours. 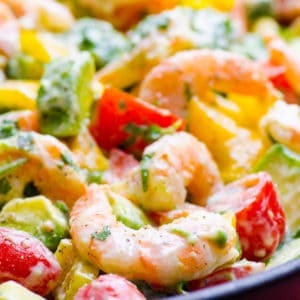 Store: Refrigerate cucumber and tomato salad for up to 24 hours (Pyrex bowls with lids love forever). 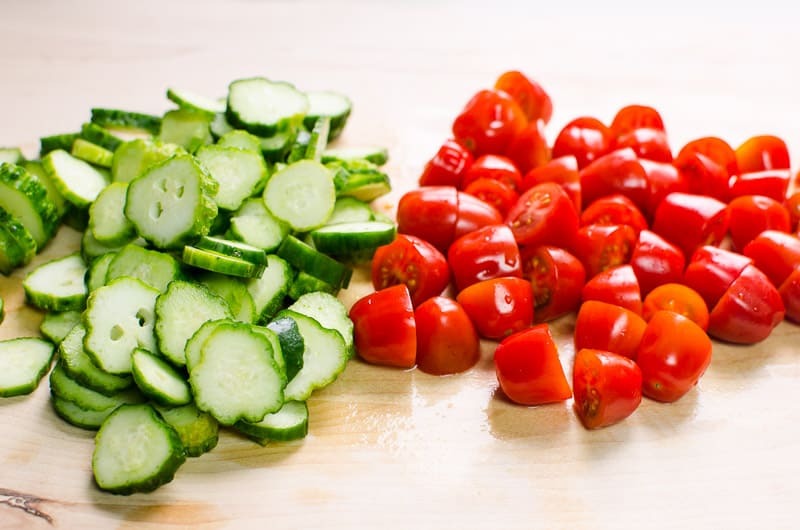 Make Ahead: Refrigerate all vegetables in a bowl covered. Then add oils, salt and pepper right before serving (as soon as you add salt – salad “leaks”).